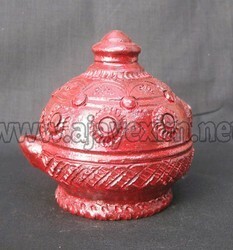 We are one of the prominent Manufacturers, Suppliers, and Exporters of Decorative Clay Oil Lamps. Our Decorative Floating Diyas are preferred for their availability in multiple colors, stunning designs, and reasonable prices. Minimum Order of Quantity 5000 pieces...!!! Size/Dimension: 25 x 11 cms. This oil lamp is designed for indoor and outdoor. These Decorative Oil Lamp & Fragrance Burners spreads fragrance in the atmosphere in a pleasant manner. We are dealing in Bronze Gajalakshmi Lamp. Clients can avail from us an astonishing range of Sl – 241101. Our product range is manufactured from quality raw material that is procured from our trusted vendors. These products are treasured for their fine finish, reliable performance, and contemporary and traditional looks. Clients can avail these products at market leading prices. AUthentic Lotus Flower Shape Oil Lamp to add to your authentic Lamp collection. Jalani divya deepak purely made by Ghee. This is used in daily God worship and Ocassionally on Diwali puja. Tulsi Pooja. Jalani Divya Deep is a small lamp that is lit especially at Temples in Daily God Worship in the Morning & Evening Aarti or Pooja, Office and Home Pooja Diwali, & other places (New Year's in India). Anchor Light: H- 10" x W - 5"
Size is including Glass: H -1’.9"x W -6"
Ship Light ( Available in Red, Green & White color Glass ): H 11" x W- 6"
Exporter and supplier of oil lamp, metal oil lamp, brass oil lamp, bronze oil lamp Manufacturing and exporting of oil lamps like brass devdas oil lamps. 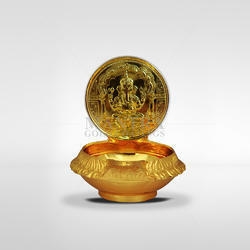 A diya divaa, deepa, deepam or deepak is an oil lamp made from metal brass. Beautiful metal made handmade craft. Unique for Gift.